Under the Tax Cuts and Jobs Act, the personal exemption is suspended through 2025, balanced by other provisions, including the near-doubling of the standard deduction and an enhanced child tax credit. Some states mirror the federal government’s personal exemption, but many others set their own dollar amounts while using federal eligibility definitions. Conformity to the Tax Cuts and Jobs Act introduced doubts about the status of some states’ personal exemptions, with the federal approach—zeroing out the personal exemption rather than repealing it outright—interacting with state statutes in unexpected ways. Six states saw the repeal of their personal exemptions under TCJA conformity, while legislators in another five states acted to preserve exemptions that might otherwise have been wiped out. Minnesota would lose its personal exemption if the state updated its conformity statute without expressly providing for its retention, and ambiguous language remains on the books in several other states. When federal lawmakers suspended the personal exemption for tax years between 2018 and 2025, that decision had ripple effects in the states, many of which incorporated the provision into their own tax codes. Whereas most other individual income tax changes under the Tax Cuts and Jobs Act of 2017 (TCJA) proved fairly straightforward for states to incorporate, zeroing out the personal exemption created significant uncertainty in some states and, for a few, took much of the year to sort out. With tax year 2018 in the books, six states which previously offered personal exemptions eliminated them in line with federal law, while a seventh state (Kentucky) eliminated its personal exemption as part of a broader tax reform. Five states took legislative action to restore a personal exemption that would have been eliminated otherwise. Another thirteen states which reference federal law in the calculation of their own personal exemptions already did so in such a way as to preserve the exemption for state filers. For states which conform to other changed federal income tax provisions, like the higher standard deduction, the ramifications were straightforward. The personal exemption was another matter altogether, largely the result of the procedures under which federal tax reform was adopted. The TCJA was enacted as a reconciliation bill, under Senate rules which limit debate and amendments for budget reconciliation measures. The reconciliation process made it easier to enact tax reform, but it came at a cost of legislative flexibility. Many individual income tax provisions, in particular, are temporary, yielding provisions that are zeroed out rather than repealed out. The personal exemption statute is still necessary, as it might be restored in 2026. Hence, Congress reduced its value to $0 but retained it in law. For the handful of states which conformed to the federal personal exemption without any modifications, the consequence was straightforward: elimination. Many states, however, substituted different dollar values for the personal exemption, but used federal definitions to determine eligibility of those exemptions. After enactment of TCJA, seemingly inconsequential differences in the wording of those provisions could mean the difference between offering or denying an exemption at the state level. In some states, a deduction or exemption is provided for each filer, spouse, and dependent, in an amount set by the state. More frequently, states establish a personal exemption amount that might differ from what the federal government offered—$2,250 in Kansas, for instance, or $1,000 in Michigan—and then provide a state exemption, in that amount, for each exemption allowed the taxpayer under the Internal Revenue Code (IRC). In other cases, states incorporate all federal exemptions claimed. Using definitions of dependents preserves state exemptions, as does tying the state exemption to the number of exemptions allowable under federal law. Here, California is typical, offering exemptions for filers and “for each dependent … for whom an exemption is allowable under Section 151(c) of the Internal Revenue Code.” Under federal law, exemptions are still allowable, though they are worth $0 for federal tax purposes. California’s personal exemptions, therefore, remain in place. “Allowable,” however, is just one of many ways that states reference the IRC’s treatment of personal exemptions. Other states key in on the number of exemptions an individual can lawfully claim (Delaware), dependents as defined in IRC § 152 (Maryland), the number of exemptions for which a taxpayer is entitled to a deduction (New York), the number of deductions allowed for personal exemptions (Maine, formerly), or the number of exemptions allowable on the filer’s income tax return (Michigan, formerly), to name a few variations. Each has a slightly different meaning, and potentially a different outcome. Unsurprisingly, the initial result was uncertainty, with lawmakers, administrators, and tax professionals sometimes unsure, and occasionally at odds on, whether a given state’s personal exemption could be claimed for tax year 2018. 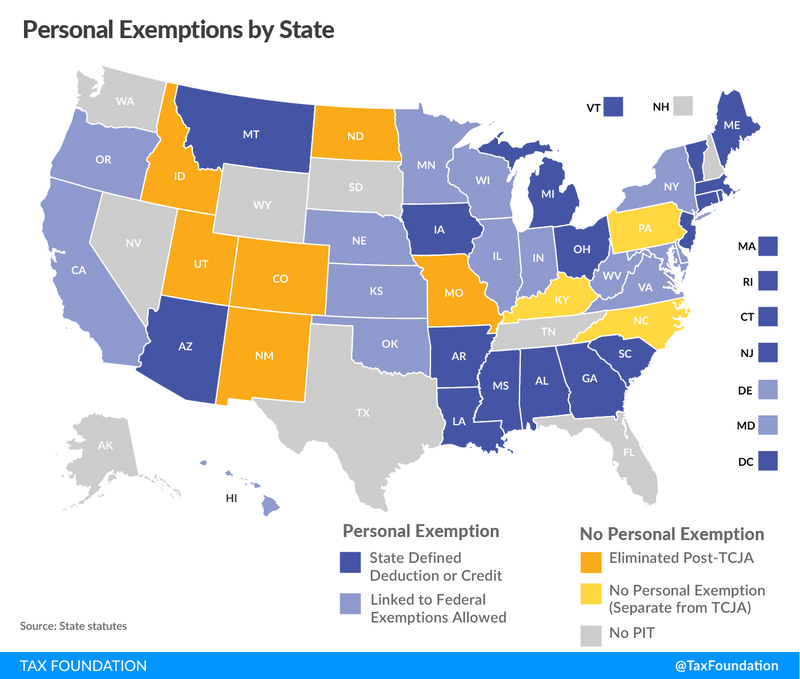 As tax season approaches, though, states have clarified the status of their personal exemptions. Notes: Minnesota conforms to federal policy, but still uses the IRC as it existed in 2016 and thus retains the personal exemption. Three states (KY, NC, PA) impose wage income taxes but lack a personal exemption. Nine states forgo a tax on wage income. In Missouri, legislators took the opposite course, resolving an ambiguity (“if he or she is entitled to a deduction for such personal exemptions for federal income tax purposes”) in favor of the clear elimination of the personal exemption, albeit as part of a larger tax package which reduced income tax rates and provided other tax relief. Two other states, West Virginia and Kansas, illustrate just how unclear the ramifications of such legislative language can be. Both states, like Missouri, referenced being entitled to a deduction for personal exemptions. West Virginia’s code provided a deduction for “each exemption for which he or she is entitled to a deduction for the taxable year for federal income tax purposes,” and policymakers, fearful that it was insufficient to retain the personal exemption, adopted new legislation stipulating that the phrase means “the exemption the person would have been allowed to claim for the taxable year had the federal income tax law not been amended to eliminate the personal exemption for federal tax years beginning on or after January 1, 2018.” In Kansas, by contrast, similar language (“for each exemption for which such individual is entitled to a deduction for the taxable year for federal income tax purposes”) has been understood to preserve the state’s personal exemption. Thus, while states have settled on their interpretations for tax year 2018, the language of these statutes could continue to matter in the coming years—and, in particular, the choices states make now will have implications in 2026, should the new federal law be allowed to expire. The following table delineates the statutory language used by states which rely on federal definitions of eligibility but have nonetheless been understood to retain their own personal exemptions. Of these, two states—California and Virginia—have yet to conform to the new federal law, though their personal exemptions should be unaffected when they do. Minnesota is the only state in which the retention of the personal exemption is indisputably contingent on the state’s conformity date. The state’s tax starting point is federal taxable income, which includes the federal standard deduction and (zeroed-out) personal exemption. However, legislators punted in 2018, with the state’s tax code still tied to the IRC as it existed prior to federal tax reform. As such, the personal exemption is retained—for now. Virginia also offers a degree of uncertainty. Although lawmakers updated the state’s conformity date during the last legislative session, they expressly excluded most of the provisions of the TCJA, leaving those for later consideration. The statute on the books is ambiguous, providing a state exemption for each personal exemption allowable for federal income tax purposes. There is no question that these exemptions are still allowable, though they no longer have an income tax purpose and do not appear on federal tax forms. Nevertheless, tax officials in Virginia have signaled that the personal exemption will be retained. In most states, conformity to federal tax changes results in additional revenue, since many of the base-broadening provisions are incorporated into state tax codes, while corresponding rate reductions are not. The elimination of the personal exemption is part of that puzzle, and is particularly significant in states like New Mexico, which is expected to finish the current fiscal year with $1.4 billion in excess revenue, largely due to the growth of the state’s oil sector, but with a substantial assist by tax base broadening. When these state tax provisions were written, there was no reason to anticipate a $0 federal personal exemption; variations in statutory text which loom large now were insignificant when adopted. States which have eliminated the personal exemption should consider offsetting reductions, to the extent that they have not already done so. States which currently diverge from federal treatment might consider aligning with the new federal law as a pay-for to facilitate reforms. And where any ambiguity remains, legislators should seek to address it. Federal tax reform creates many opportunities for states to reform their tax codes. It also, at times, requires efforts to enhance clarity. Cal. Rev. & Tax. Code § 17054(d)(1)(A). MD Code, Tax – General, § 10-211(1)(a). McKinney’s Tax Law § 616(a). VA Code Ann. § 58.1-322.03(2). W. Va. Code, § 11-21-9(f). Morgan Lee, “Oil Sector Boosts State Government Fortunes in New Mexico,” Associated Press, Dec. 11, 2018, https://www.lcsun-news.com/story/news/local/new-mexico/2018/12/11/new-mexico-oil-gas-boom-state-government-funding-budget-surplus-revenue-economy-education/2272929002/.